Huge Savings Item! Save 14% on the Steelbody Flat Bench STB-10101 by Steelbody at Strongman Pictures. MPN: STB10101. Hurry! Limited time offer. Offer valid only while supplies last. Strong. Powerful. Built to last. The Steelbody flat bench is a no-nonsense, workout essential built to maximize your strength training success. Strong. Powerful. Built to last. The Steelbody flat bench is a no-nonsense, workout essential built to maximize your strength training success. Featuring solid steel construction, a durable, high density pad, and heavy-duty legs for maximum stability and support, this industrial-inspired, high quality bench is ideal for beginners and serious home trainers alike. 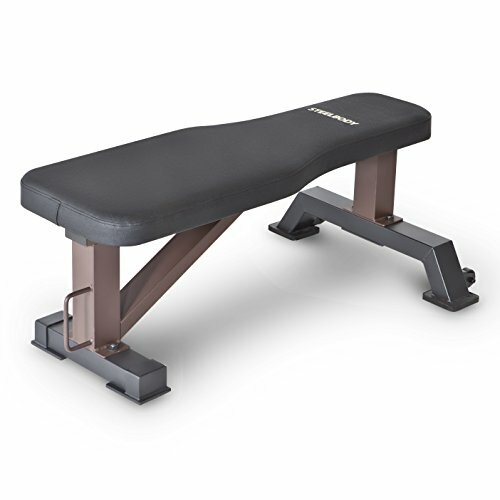 The convenient transport wheels and handle, along with non-marking foot pads and end caps, make the Steelbody flat bench ideal wherever you work out. Combined with a powder-coated finish and the versatility to be added to any rack or cage system, this strength-training staple is sure to be the workhorse of your fitness routine.